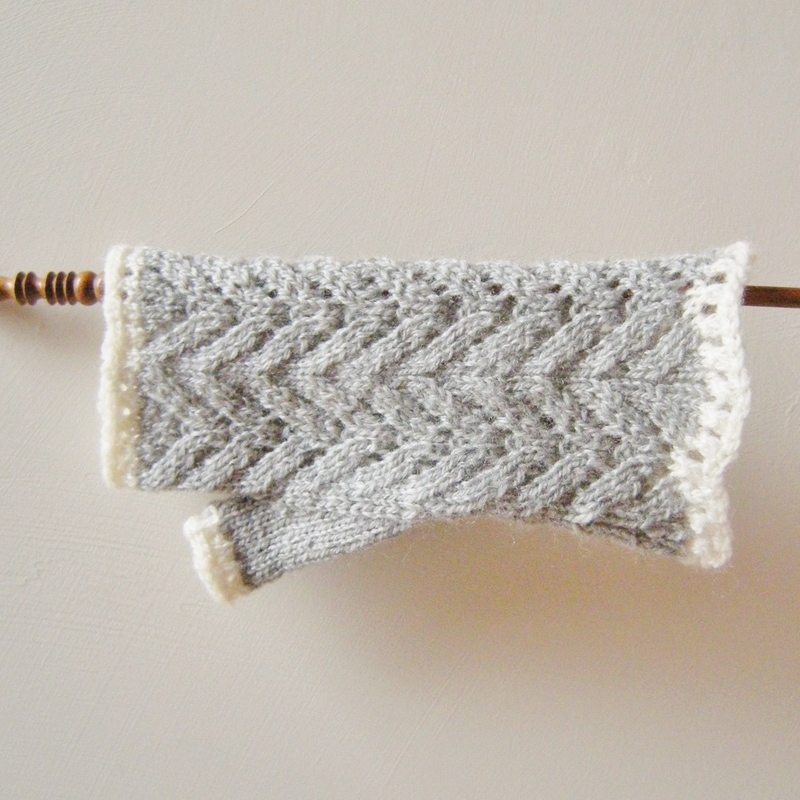 I love this pattern, a traditional lace motif called ‘feather & fan’ which is so easy it can be knit in my sleep. But these are the first striped versions of the pattern I’ve tried, and will try one more in stripes, with yarn mentioned on this post, before the summer is over. As I dared myself to not make a peep until I finished these two, now there may be some chattiness! On my knitting needles, I have still some promised summer knitting for my two beautiful California nieces (whom all of you are familiar with ~ presently Miss Sixteen & Miss Thirteen ), and then its looking into a stretch of who-knows-what-may-come for a quiet spell of imminent lazy & hot summer weeks. Blue stripes project details on Ravelry HERE, and pink stripes project details HERE. We decided to photograph not in the town of Calistoga this time, but again at the castle. Late morning brought very bright sun and was very warm after weeks of cool rainy days. Oh, and great news is that my knitted tees seem to fit my nieces with absolute perfection! This year’s Spring Tee was not a new design, but a fun redesign for ‘four seasons of necklines’ option for my Calidez pullover pattern. Both made in size 32 with short sleeve option, alternate style of yoke decrease, 2×2 rib, and knit with worsted-weight ( Malabrigo Rios) , using the gauge substitution chart included in the pattern. I must say, I rather impressed myself once I saw the short-row low swooping necks become three dimensional! Miss Thirteen has gained inches in height still again, and now there’s no denying she is taller than Miss Sixteen. Time goes swiftly, and I’ll enjoy a short rest before coming up with plans for the next equinox sweater~~ but folks, this is just as good as it gets! A very bright but chilly November morning, in the usual places we photographed, the ‘four corners’ of Lincoln & Washington Streets in Calistoga. This year, things are quite different all around. First of all, what normally would have been the actual time of equinox, the infamous and devastating wildfire of Lake County held things off for two months. But here we are, back to our familiar places. . .
Other things about this year, as predicted, Miss Twelve is now Miss Thirteen, and has grown so tall that she is now beginning to tower over everybody, including her ‘big sister’, Miss Fifteen (but very soon-to-be-sixteen!). Miss Thirteen is now in Middle School, and on the volleyball team (they smashed all the other teams and came in first for the season!) and Miss Fifteen is excelling in cross-country running 3rd year in a row, and about to go to the post-season competitions ~~ and about to get her drivers license too! Since all is going well with them, I’ll get back to the business of the sweaters . . . These two being modeled are samples of Calidez. I knit these Autumn Sweaters as I did the prototype, in Cascade 120 superwash ~~ extremely lofty and poofy yarn~~ and these pullovers knit up at lightening speed being bulky-weight yarn, and the instant impression from my nieces was ‘oh they’re soooo soft ‘. So I recommend this yarn if one wants a ridiculously soft but still pure wool experience. after the photo shoot we went on a book-buying spree for Miss Thirteen’s birthday ! I think this Autumn Sweater design for my nieces is up to par and is deserving of the usual title of ‘Sweater Success!’ Now, those of you who are new to this blog, you must see Sweater Successes past, go HERE and be sure to scroll all the way down~~ to 2010! What do I have here? 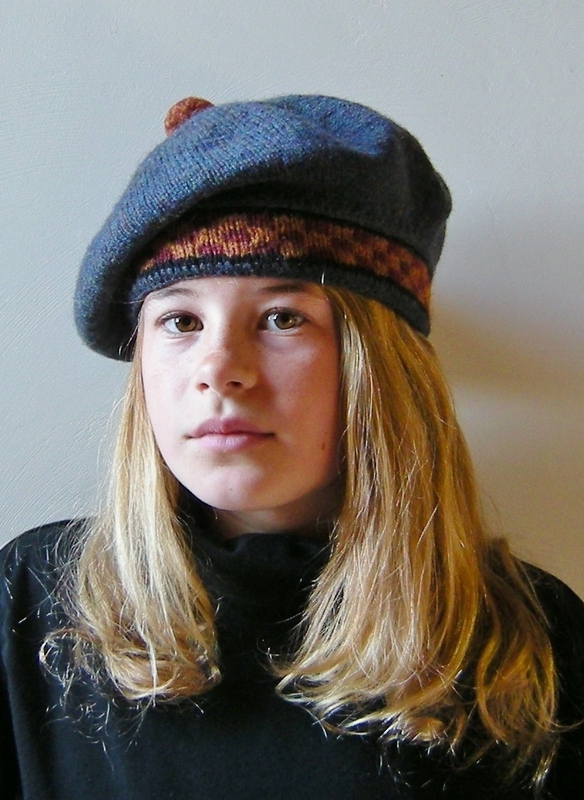 Something very tweedy for Autumn! A set of my Tartan & Tweed Tam & Mitts for an Autumn birthday gift, and a pretty nice ensemble of Autumney finds of local acorns and fir cones. 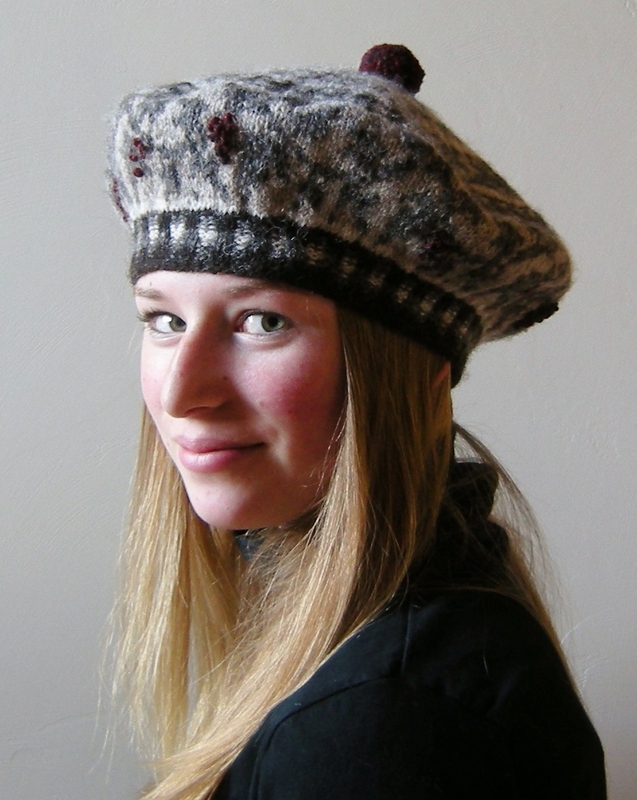 I have used a lovely yarn of alpaca-wool blend called Berroco Ultra Alpaca Light, which I really love, and adorned not with a pompom or toorie, or beret loop ~~ but a Dorset Button. That is the news from my neck o’ the woods, and I’m roaring along rather productively on another mitt design, soon to be done & dusted with it. I hope you are all having a wonderful Autumn and enjoying the turning of leaves and things to gold & rust, as I am. Its a slow turning in Northern California, but it is beginning! Feather & Fan . . . and an e-book ! Introducing Altitude “Lace”, the third of my series of three cowls designed for my Knitting @ Altitude group, with special consideration of those beginners who are up for a challenge. “Feather & Fan” I believe is a colloquial name for a traditional lace motif, and I’ve borrowed it to design a very easy lace cowl, with naught but a knit stitch, a yarn-over, and a knit-2-together is all that is needed for making one ~~ you can do it ! I must say something about this yarn too, got it over at the Local Yarn Shop in the sale ‘bin’ the other day, it is deliriously gorgeous (okay, so I guess I am a real ‘yarnie’ now)… Road To China (made in Peru) which is 65% Baby alpaca, 15% Silk, 10% Camel, 10% Cashmere. I’ve never had the pleasure of such luxury, it is beautiful, and I’m keeping this prototype to wear all the time. That’s about it. I’m trying to figure out still how to assemble the e-book on Ravelry, but until I do I’ll just have them all sold separately, no harm in that. You can find Altitude “Lace” on this site HERE , and on Ravelry HERE . . . .
Edit In : I’ve now got my first e-book together ~~ Altitude Cowls !!! Introducing Calidez! My nieces and I had a double-design photo shoot in St.Helena last week in the scorching heat of a late July morning, for Altitude Cowl and for Calidez. At ten o’clock the mercury rising up into the 80’s, proves that my nieces are really quite good at the modelling thing after all. I designed Calidez to be a most basic & versatile pullover, that hopefully I can see examples forthcoming from knitters and myself, of it’s many options from plain pullover , or with stripes, cable, rib, or lace panels, or even cardigan ‘afterthought’ option. 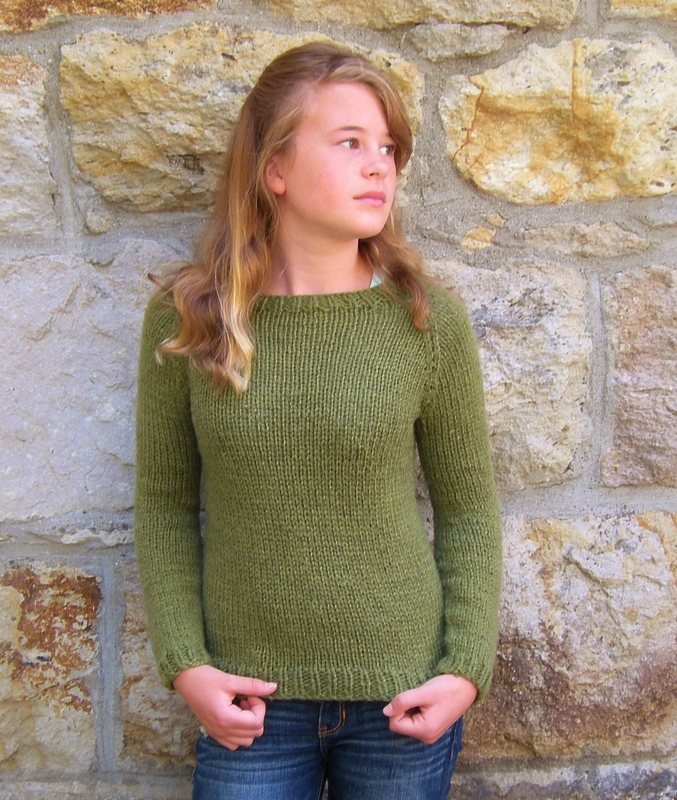 Calidez is shown on Miss Twelve in size 30″, the prototype and smallest of the bulky-weight size run, and looking a little like “outgrown the sweater that auntie knit Christmas before last” … but she carries it so well. 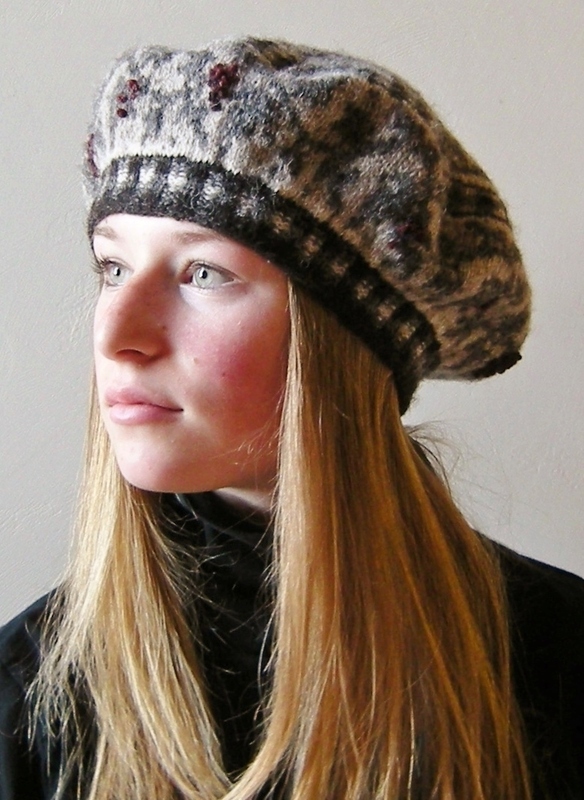 Please see the pattern page on this site HERE and on Ravelry HERE, and try out your version. What can you do with Calidez? My nieces and I had a double-design photo shoot in St.Helena last week in the scorching heat of a late July morning, for Altitude Cowl and for Calidez. At ten o’clock the mercury rising up into the 80’s, proves that my nieces are really quite good at the modelling thing after all. So Altitude Cowl was designed to be a very easy knit for beginner knitter , for teaching in my Knitting @ Altitude group that is soon-to-be-forming (so excited!). 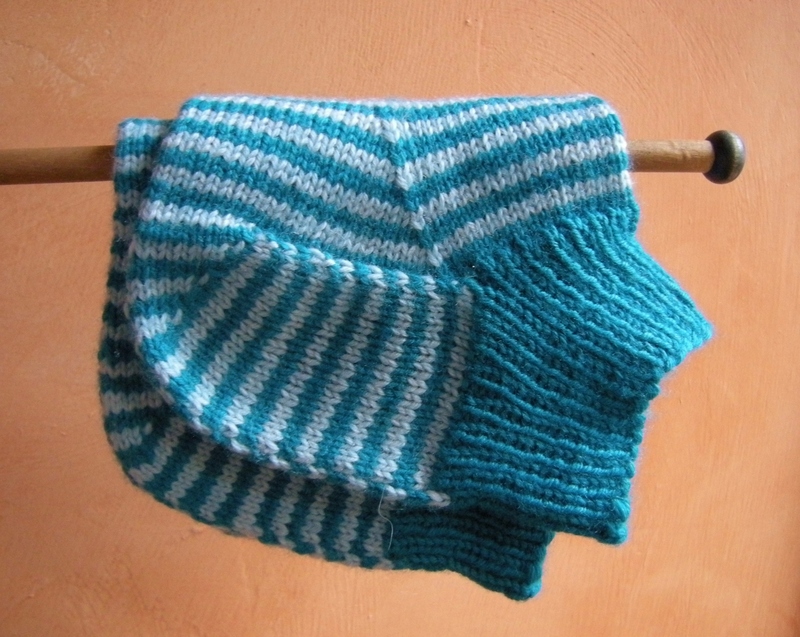 Actually , this one is first in a series of easy cowls, this one being ‘twists’. The next will add to make the pattern my first official e-book, and it will grow from there to hopefully a handful of easy cowls. It can be worn tossed on over the head, or folded and pinned. 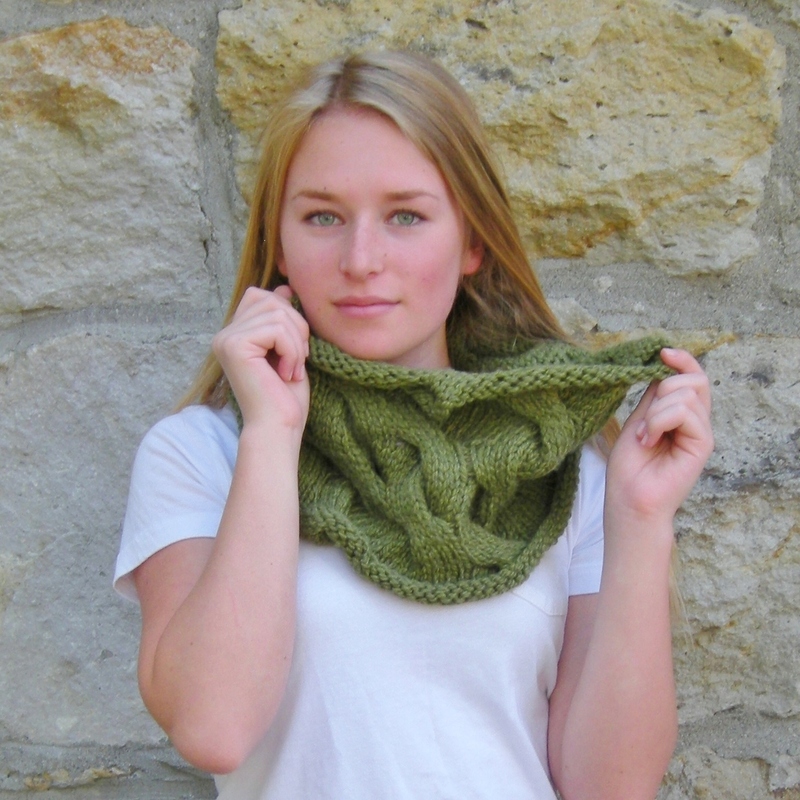 It is a very showy deeply textured cowl that is ‘all about the yarn and the twists’ and I hope you try it! ‘Una Cosettina’ has had a bit of an overhaul in recent winter weeks. 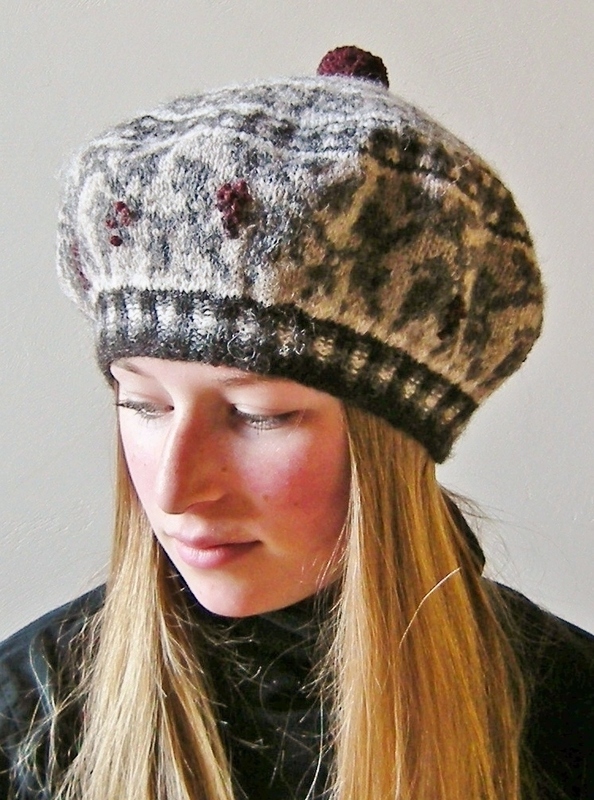 I have knit up several more variations on the original design from nearly a year ago. Now pattern has options to work lace up the back of the hand, (I so wanted to do this , and now it is done and I’m satisfied!) . You can create a full lace gauntlet , or a sporty shorty little wisp of a mitt, or anything in between. Options to omit i-cord cast-on & bind-off and/or eyelet round, and skip straight to the lacework. 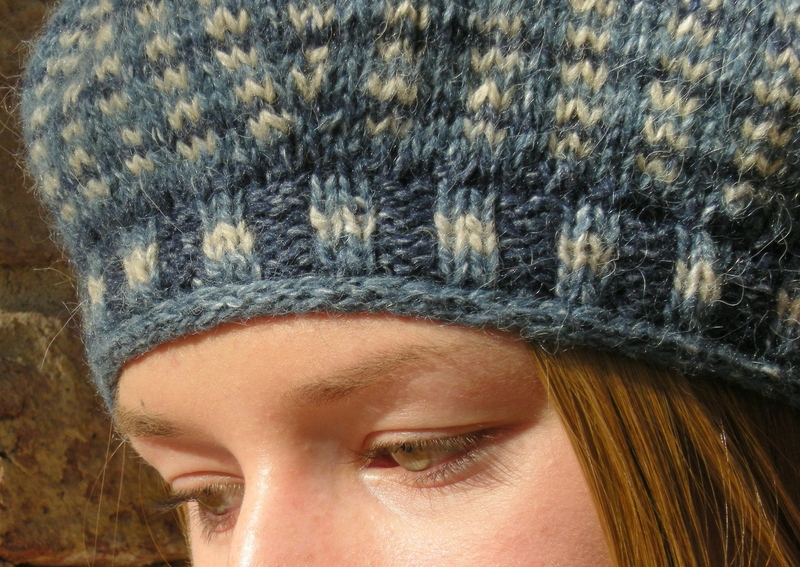 To me a bounty of choices makes a good pattern and as much fun to wear as it is to knit as it is to write! 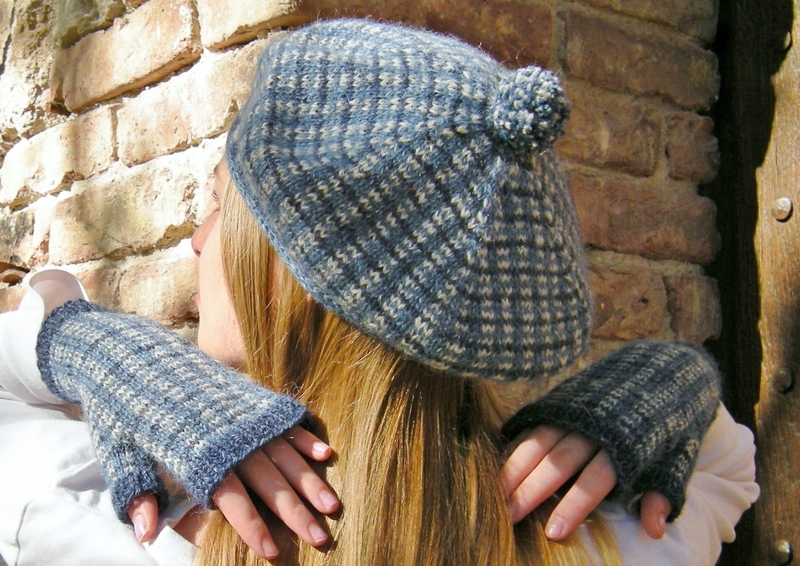 But frankly folks, this pattern is all about using that one-of-a-kind skein or ball you have. Perfect for those lovely singles of your own spindle-spun yarn or that lovely skein of luxury yarn you couldn’t resist buying from that great yarn shop you just visited. Maybe you discovered a ball of vintage yarn in your grandmother’s attic which narrowly escaped a pair of argyle socks in the 50’s, or that novelty yarn you bought from the 13th-Century wool mill while visiting the town of Biella in Italy. 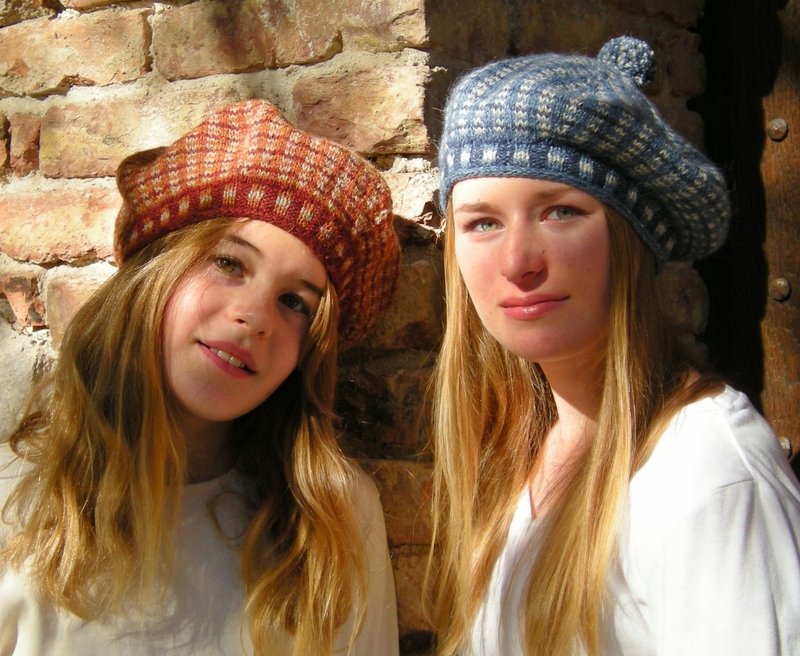 Una Cosettina meets One-Skein-Project-itis and makes a stunningly beautiful friendship. 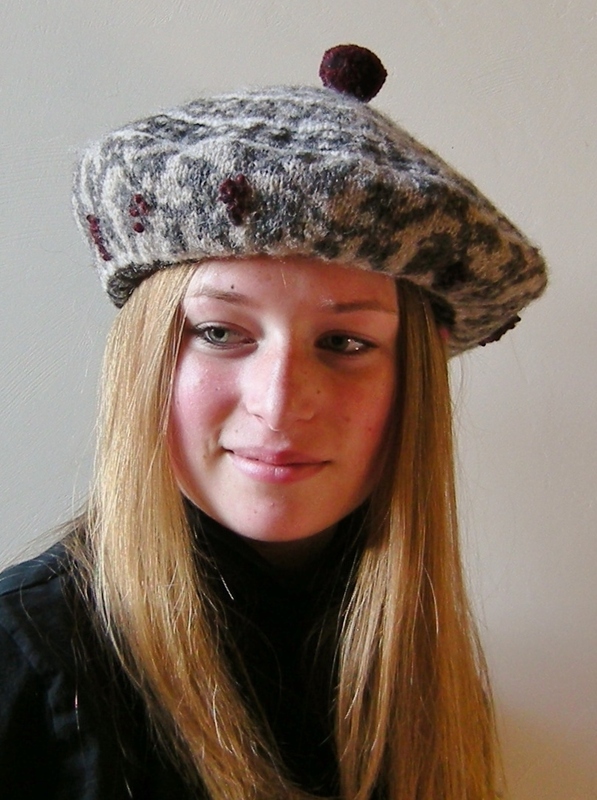 This pattern can be found on Yarnings HERE, and detailed on Ravelry HERE. Hats were the occasion this morning. We opened the cedar trunk with knitted hats, scarves, gloves, and sweaters . . .
Niece Who Is Fourteen did a stellar job of giving new life to the rows of vines with deep red clusters of California Cabernet Sauvignon grapes . . .
and a fresh perspective to my Vineyard Rows California Highland Bonnet ! 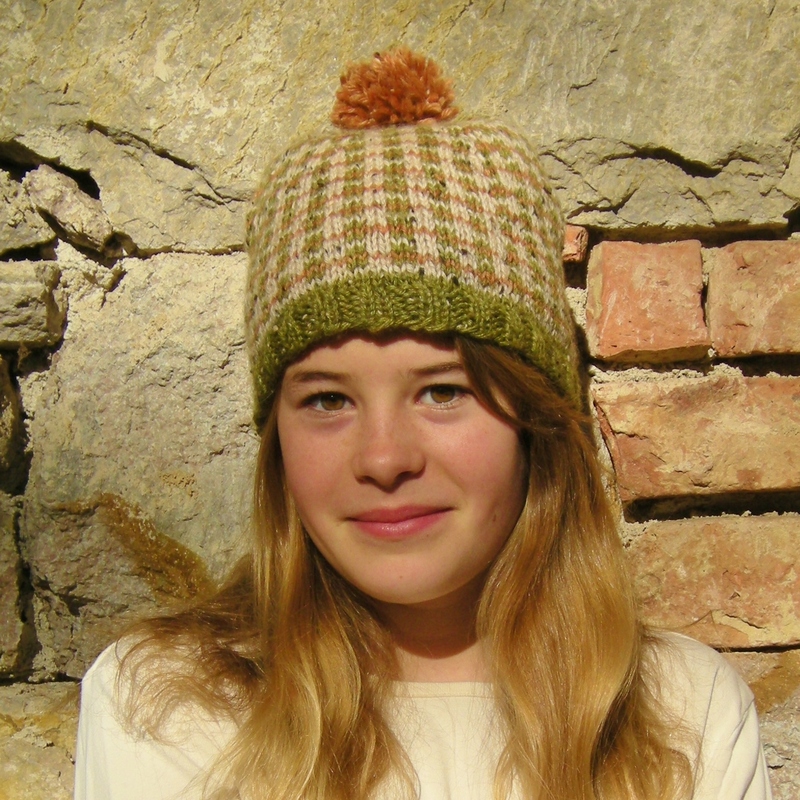 we have a new look for Dicey Highland Bonnet too . 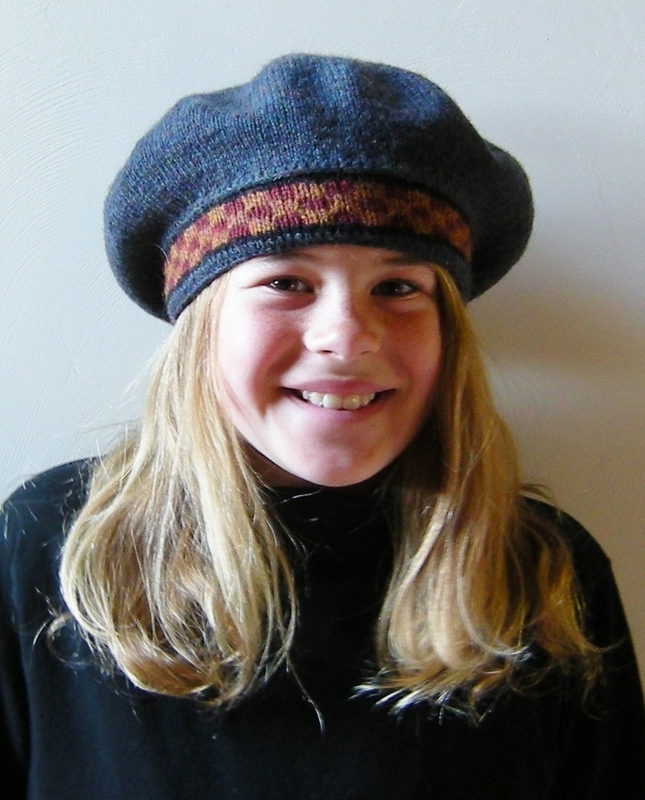 . .
Something about the charm of an Eleven Year Old . . .
Oh, but that’s not all ! 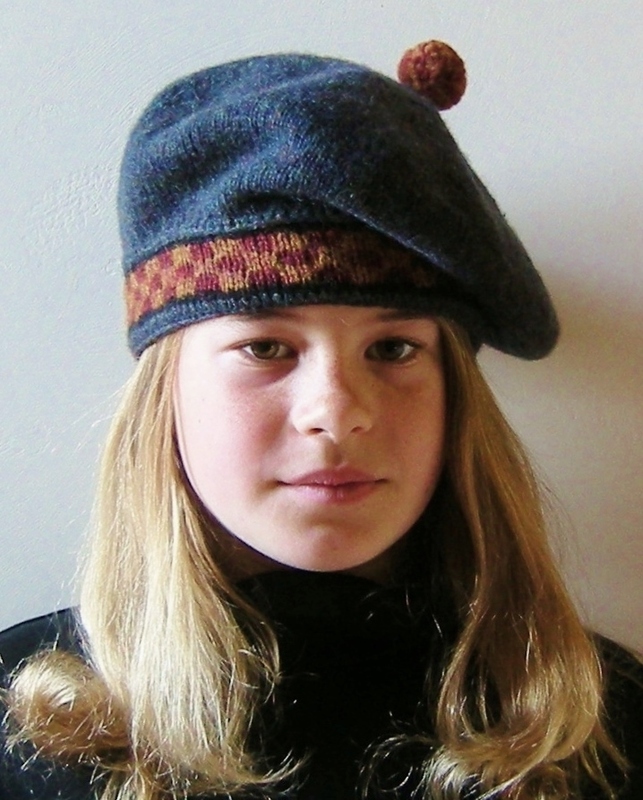 Last-not-least, a hat made by Lizzi from the actual Scottish Borders ! We also got some great shots for the new & improved design of Penny Candy Socks, too, but I won’t show you until the pattern is all ready to go . So watch this space ! The skies were perfect blue & sunny, and we had a terrific time for photographing Spring Tees 2014 ! This year, the design Penny Candy Tee has made it all the way to a published design, and I managed to get it all up and available in time to post the pattern ~~ right over HERE. What a crescendo, happy beautiful faces, and stellar lighting, with charm that just blew my socks off. I couldn’t believe my eyes, how much these girls have learned in the skills of modelling knitwear for their auntie. I am even getting a little teary just thinking about it. But on with the show ! The first always to be photographed is the mint green bank building of Old Town Calistoga . . Then we cross Lincoln and shoot against the terra cotta wall outside of Brannon’s Restaurant for our usual series of slightly goofy shots . . . .
Then we go to the corner outside of Hydro Grill. now completes Four Corners, at the intersection of Washington & Lincoln Streets. 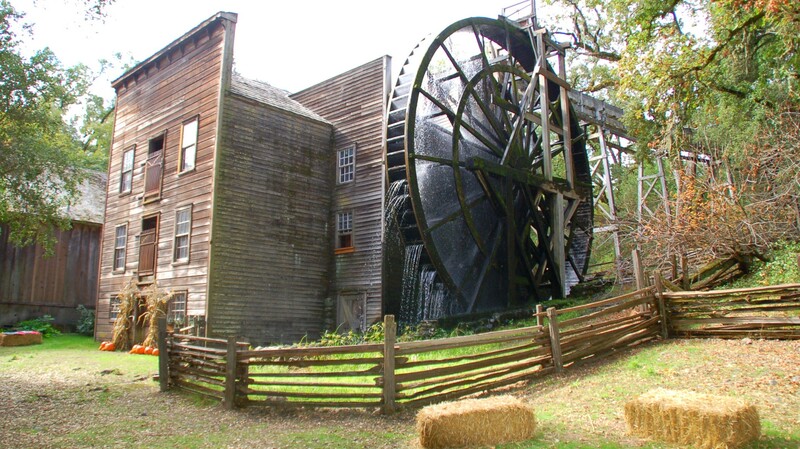 Then we make our way to the big mural of Old Town Calistoga ! The same poses are great because one can really see how the girls have grown in the years that I’ve been knitting for them (and blogging about it). At the end of this post is a big long slideshow, I hope you watch it ! However, as this post is also a pattern debut, I must say, some lovely detail photos were taken. Just look how lovely the neckline , with the scalloped neckline & mitered corners looks in these details . . .
And just how the bottom icord edge with scalloped lace pattern works . . .
Last not least , the back shoulder, and short rows. The neck is just low enough in both the front and back. 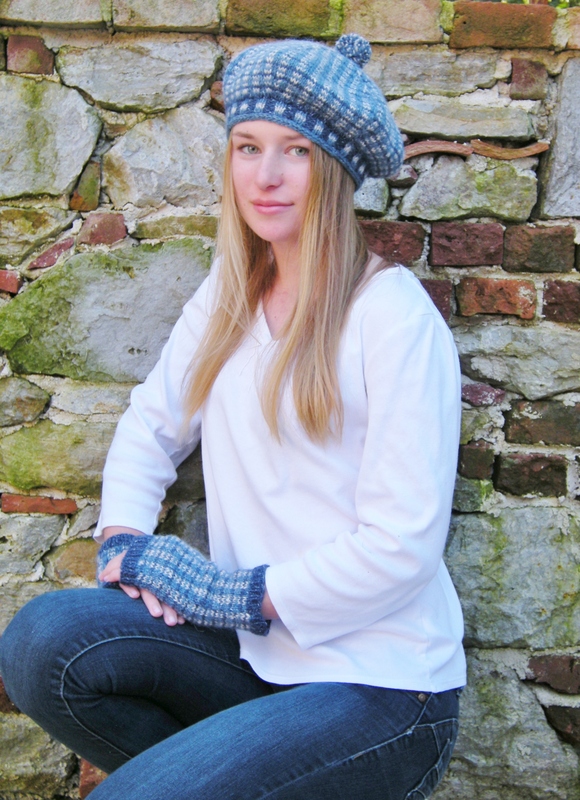 . .
Friends & Knitters, you can find the pattern over on it’s own page Penny Candy Tee Pattern page , here on Yarnings. or on Ravelry HERE Plenty to peruse, but, before you click off this page, the best is waiting next in this little slideshow !!! Thank you girls, you’re the one’s who made me into the knitter I am, and if it weren’t for you, there’d be no Yarnings. Here on this bench outside of Calistoga Roastery, we closed for the day, and I want you to see the first photo taken of them, on this same bench wearing the first cardigans I knit for them! Edit In : I have rounded up most of the photos of my nieces here in Yarnings over the last four years. 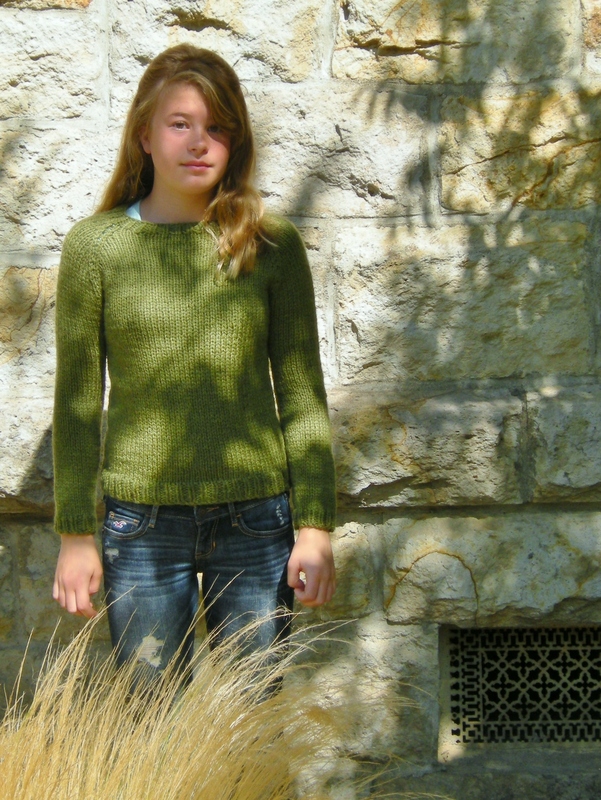 From present retrospect back to the first sweaters I knit for them in March 2010 . Simply click : Sweater Success ! 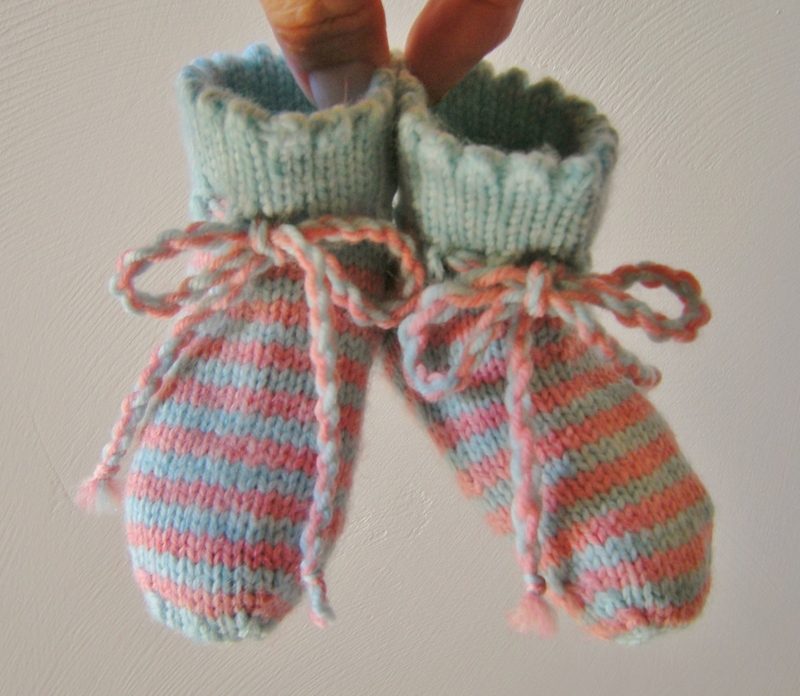 Words that describe these socks are ~ darling, dainty, delightful, durable. More words are practical, comfortable & completely reminiscent of the bygone era of bobby socks. (I still have yet to make a fresh white pair, with powder blue or blush tones for contrast trim). They’re smart and tough too, evoking for me a very pretty tomboy girl of sixteen. Yes, definitely and understatedly pretty, from the frilly top down to the sturdy toe. And now . . . to celebrate ! Thank you everybody for being a colossal support, I really feel I couldn’t have done it without your lovely comments & personal messages along the way ~~ xoxoxo!!! 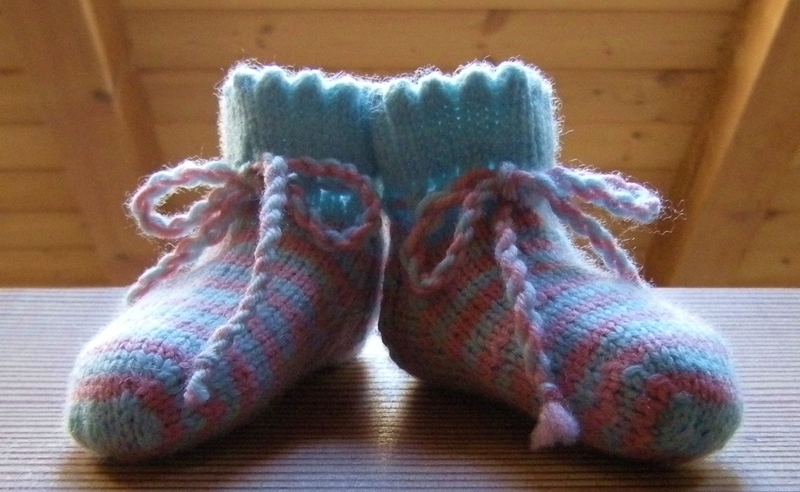 Pretty Little Things Socks pattern on Yarnings right HERE. And if you fancy a gloves in a matching set, see Pretty Little Things Gloves !! I have included it (for no additional charge) with Penny Candy Socks Pattern but not knowing how to separately add the pattern to the one, as a duet, I have just copied and pasted the whole pattern to the end of the Penny Candy Socks pattern pdf. If anybody has any advice as to how to keep them separate, but to allow them to be downloaded together, a two-for-one sort of thing, please let me know, it would be greatly appreciated ! Well, I’ve been crunching numbers for a few days, and though I’ve lacked actual test-knitting of all the sizes, they seem correct to me from a mathematical perspective. Written in sizes from Little Kid to Big Kid, and I will be test-knitting all the sizes I haven’t already, as the summer blossoms and wilts, and intending to have a lot of fun doing so ! So folks, the Penny Candy Socks pattern can be found HERE , and less than one week into summer, which is pretty good, as my goal was to post them on the actual Summer Solstice. Not bad at all. 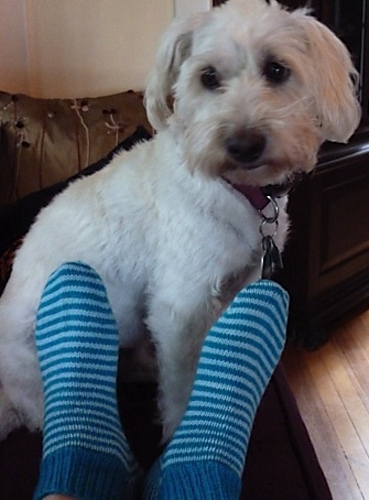 Just a little hello from my sister-in-law Pam’s feet & her dog Peggy ! I just wanted to get over this hump and submit this pattern today, though I only decided to get down to it, and polish the draft at noon. Its now 4 o’ clock and Emma is quite gloomy because we haven’t walked since Wednesday, and that was two days ago. Okay, so where is this pattern you might ask??? But also you can see it on Ravelry in my pattern store here. 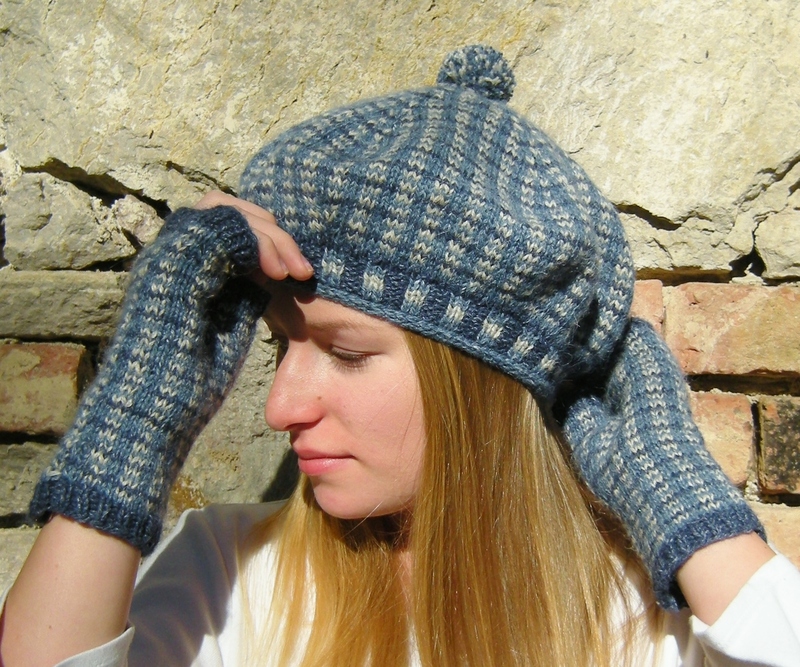 So, whats all this exhausting business of knitting pattern prototypes, and writing patterns? I have had little rest, you’d think I’m obsessed ! ( I guess I can’t hide the fact very well. ) I am actually looking forward to posting about something mundane again, like a picture post of a lovely walk in the woods, or something from my garden (which is doing quite well, with more tomato plants than I’ve ever had before), or just some knitting related Object d’ Arte about the house. But for now, if you’ll excuse me, Emma and I have a walk to do !